In this tutorial we will see how to read digital values from the GPIO pins. We will be doing digital reads, which means we will be limited to “HIGH” or “LOW” readings. This is a 3.3 volt system, so we need to make sure that the “HIGH” applied signal is 3.3 volts. Our pinout from LESSON 1 shows which pins are suitable for digital reads. 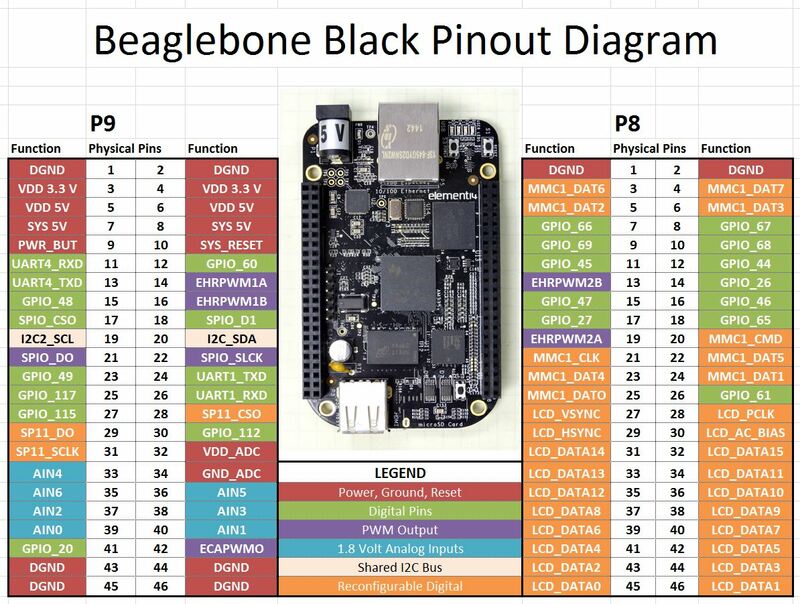 Default Pin Configuration for the Beaglebone Black Rev. C.
It is the green GPIO pins which we can use for digital reads. In this lesson we will demonstrate the digital read technique using a simple two button circuit. In order to complete this lesson, you should go ahead and build this circuit. Notice we are using Pin 1 on Header P9 as the ground and Pins 11 and 13 on header P9 s the input pins. Also note the pulldown resistors are 1000 Ohm. It is important to use at least this much resistance. If you do not have 1,000 Ohm resistors, using something larger NOT something smaller. Once you have the circuit set up we are ready to begin programming. state1 will be True if the top button is pushed, and False if it is not being pushed. Similarly, state2 will be True when the button is being pushed, and False when it is not being pushed. We can bring these concepts together to make the following program. Play around with the program and see what all you can make it do. In this lesson we will show how you can control LED’s from push buttons. In order to get started, you will want to expand the circuit we built in LESSON 29 to include two LEDs. The schematic below shows how you will want to hook things up (Also, remember you can see the Raspberry Pi pinout in LESSON 25). Also, as we have mentioned before, if you want to follow along with us in these lessons you can get a kit that has all the gear you need HERE. In the video lesson, we take you through the code step-by-step. We use the techniques learned in LESSON 29 to detect if a button has been pushed. We introduce two new variables, BS1 and BS2, so indicate the state of the LED’s. A BS1=False means the LED1 is off. A BS1=True means the LED is on. This concept allows us to determine whether we should turn the LED on or off when the button is pushed. Basically, we want to put it in the opposite state when a button is pushed. The code is below. The video shows how it works. print "Button 1 Was Pressed:"
print "Button 2 Was Pressed:"
We are now ready to learn how to “read” values from the Raspberry Pi GPIO pins. In order to demonstrate this, we will show a simple example using buttons. If you ordered the Raspberry Pi kit we recommend, you already have everything you need, or you can pick your kit up HERE. 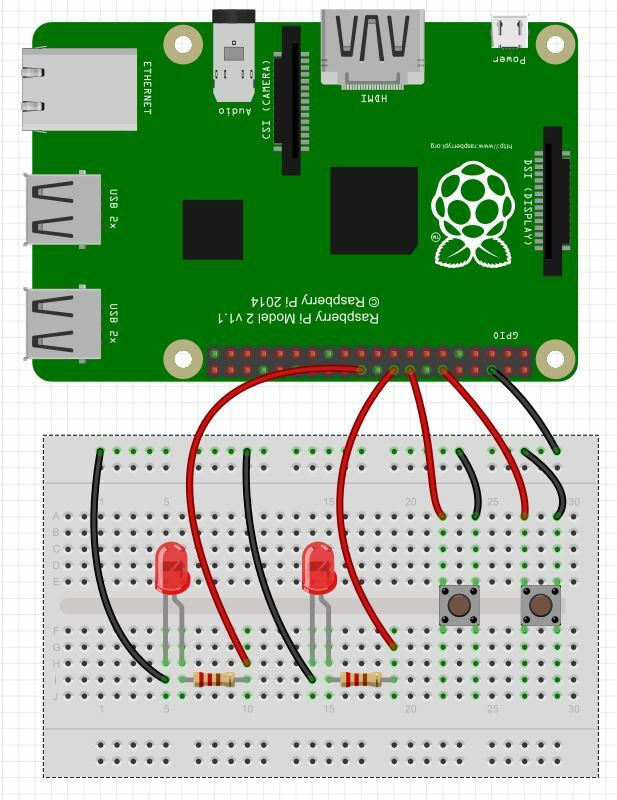 To start with, you need to put together a simple circuit that connects two push buttons to your Raspberry Pi. Connect according to this schematic. Note that one leg of each button is connected to the ground rail on the breadboard, that is connected to the Pi ground at physical pin 6. Then we connect the left leg of the left button to physical pin 16, and the left leg of the right button to physical pin 12. Now we are ready to set the pin modes on the pins we are using. We are using pins 12 and 16. We will set up variables so that we can reference the pins by descriptive variables. With this command, the raspberry pi places a pullup resistor between the designated pin and the 3.3 V rail. This means that if we simply read the pin, we will read a “1”, “True”, or “High”, since the pin will see the rail through the pullup resistor. If we connect the pin to ground by pressing a button or switch, the pin will then read a “0”, “False” or “Low” because it will be a straight connection to ground, and as current flows through the pullup resistor, the 3.3 Volts will drop across the pullup resistor. Hence, the pin sees 0 volts. The result is that with the pullup resistor activated, the pin will always report a “1” until something connects the pin to ground, and then it will read a “0”. This configuration should work for most things, but if you are getting unpredictable results which can result from electrical noise, then try using external pullup resistors. Now we are ready to read the values from the pins. while(1): # Create an infinite loop if GPIO.input(button1)==0: # button1 will report 0 if it is pressed print "Button 1 Pressed" sleep(.1) # delay if GPIO.input(button2)==0: # button 2 will report 0 if it is presses sleep(.1) print "Button 2 Pressed"
Notice that we read from the pin using the GPIO.input command. Also note that for reliable results you need to usually put a small delay in your code. This will help debounce the button, and will also give more stable results. from time import sleep import RPi.GPIO as GPIO GPIO.setmode(GPIO.BOARD) button1=16 button2=12 GPIO.setup(button1,GPIO.IN,pull_up_down=GPIO.PUD_UP) GPIO.setup(button2,GPIO.IN,pull_up_down=GPIO.PUD_UP) while(1): if GPIO.input(button1)==0: print "Button 1 Pressed" sleep(.1) if GPIO.input(button2)==0: sleep(.1) print "Button 2 Pressed"
This code will sit and monitor the buttons, and when one is pressed it will report that that button has been pressed.